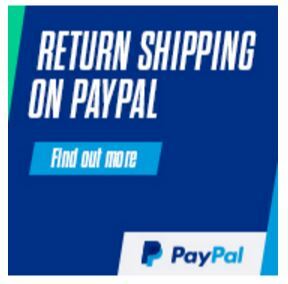 You save £21.00 that's 70% off! These dimmable gu10 led bulbs are a professional product manufactured by the award wining INTEGRAL LED which have be named WHICH best buy for spotlights in 2014 and 2015. This product is superior to the product that won the award as it is dimmable and produces a huge 480 lumens which is 100 lumens more than the the standard product making it one the brightest gu10 led bulbs available. 480 lumens could replace a traditional 60W halogen spotlight however as the bulb features the iwatt dimming module, there brightness can be adjusted to suit the mood. This 6.8W retro-fit Integral LED GU10 delivers a dimmable, cool white light and brightness, similar to a 50W halogen bulb. It features five high output Seoul LEDs, all finished in an aluminium and plastic, thermally efficient body. The ideal lamp for commercial and home use. This makes the bulb ideal for rooms such as kitchens, lounges and dinning rooms where you may what as much light as possible, when cleaning or cooking, however when relaxing or entertaining you may prefer a lower level of light. The cool white light creates a very modern looking room. If you prefer a more traditional warm light please select the warm white version. 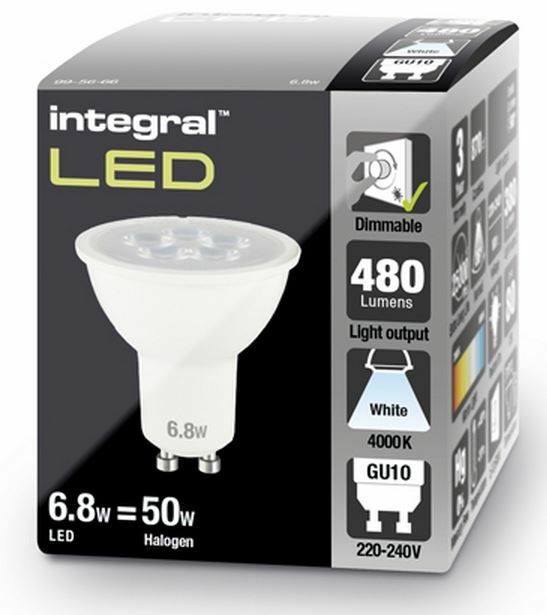 Integral the manufacturer offers a 3 year guarantee and a lifespan of up to 25,000 hours which is significantly higher than the standard 2000 hours of a typical halogen spotlight. This product features 5 high power SMD LEDs which produce a combined light output of 470 lumens. The bulb also features die-cast aluminium heat sink which increases the operating life and anti-glare reflector that assists with diffusion and is more aesthetically pleasing as the LED chips are covered. This product is suitable for both, home and commercial and is suitable for kitchens, bathrooms, living rooms, offices and bars etc. Although our gu10 LED dimmable bulbs may be compatible with some existing dimmers it is recommended to avoid any flickers that a specialized “Trailing edge” dimmer switch that reduces the current flow to zero is used to also give the full dimmable range. Normal dimmer switches are leading edge and have a minimum load of 40 Watts that means to dim the bulbs fully more that 10 gu10 bulbs would be required due to the low power consumption. When using dimmable gu10 LED bulbs the manufacturer recommends the Varilight V - Pro range of LED dimmer switches.